Frank Maguire is seen as a business guru, illuminating audiences from Beijing to Dubai, London to Los Angeles. He is both a business teacher and a master storyteller, offering a realistic and human approach to business and leadership success. Frank is one of the nation’s leading authorities on corporate culture, leadership, customer service, productivity and communications. If you have ever FedEx’d a package, watched Nightline, flown on American Airlines, or eaten at Kentucky Fried Chicken, you have been touched by the work of Frank Maguire. One of corporate America’s most proven achievers and innovators, he served as founding senior vice president at Federal Express, a key executive during expansion of Kentucky Fried Chicken, a director of program development for ABC who helped jump-started the careers of popular television personalities, and a major player during the growth of American Airlines. He now heads Hearth Communications Group, a global communications and consulting firm. His book,You’re the Greatest, details how to recruit and retain a motivated and dedicated workforce. While at Federal Express, Frank Maguire was a key component of the management team that turned the “absolutely, positively overnight” commitment from a hope into a reality. 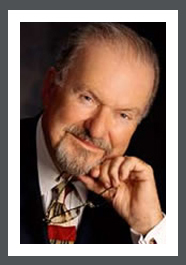 He created the corporate culture that resulted in Federal Express being named “The Top Corporation of the Decade” by Fortune magazine and recipient of the 1991 Malcolm Baldrige National Quality Award. As director of program development for the American Broadcast Company, Frank launched the careers of two aspiring journalists, Charles Osgood and Ted Koppel, As senior vice president of Kentucky Fried Chicken Corporation, it was Frank who counseled Colonel Harlan Sanders and John Y. Brown when KFC was the fastest growing company on the New York Stock Exchange. And at American Airlines, Frank played a key role in expanding the company’s service to Hawaii, the South Pacific and the Caribbean. Before benefiting some of the most dynamic corporations of America, Frank Maguire served in the executive offices of Presidents’ Kennedy and Johnson. A passionate motivator, he provides audiences with the ideas, attitudes, and feelings necessary to create an informed, inspired and involved organization. Frank is the author of “You’re the Greatest”.